So this morning, there were a few birds around, but since I took a lot of pictures yesterday, I decided to have some coffee and a muffin and maybe pictures later. 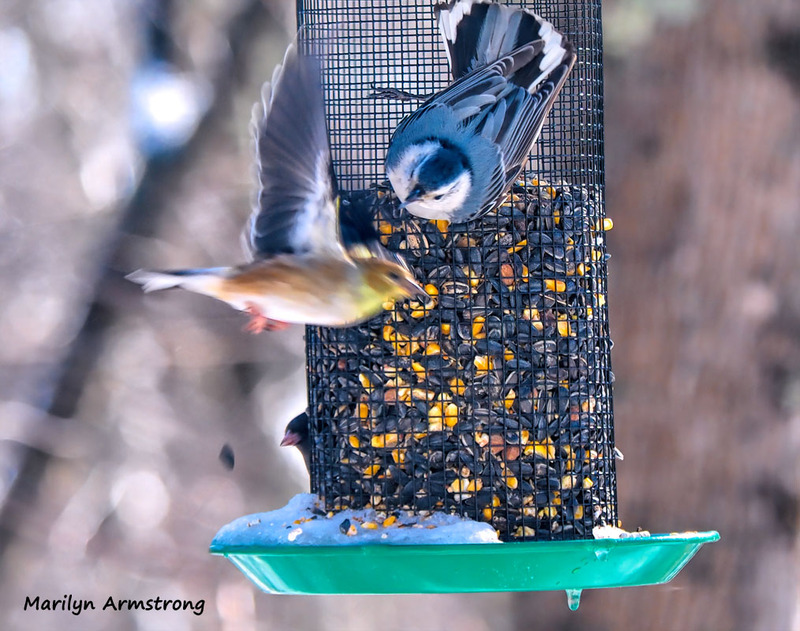 About an hour later, I went into the kitchen to see what I could grab to eat and there was a mad flapping around the feeder and every bird in the woods was trying to get a few seeds. 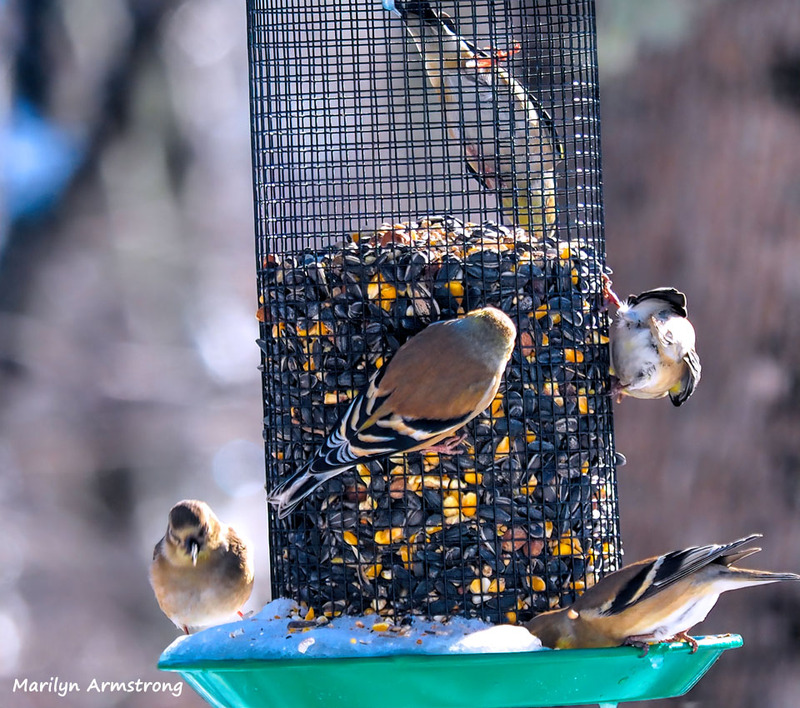 Maybe they thawed a bit since yesterday, but the birds were really, really hungry today. 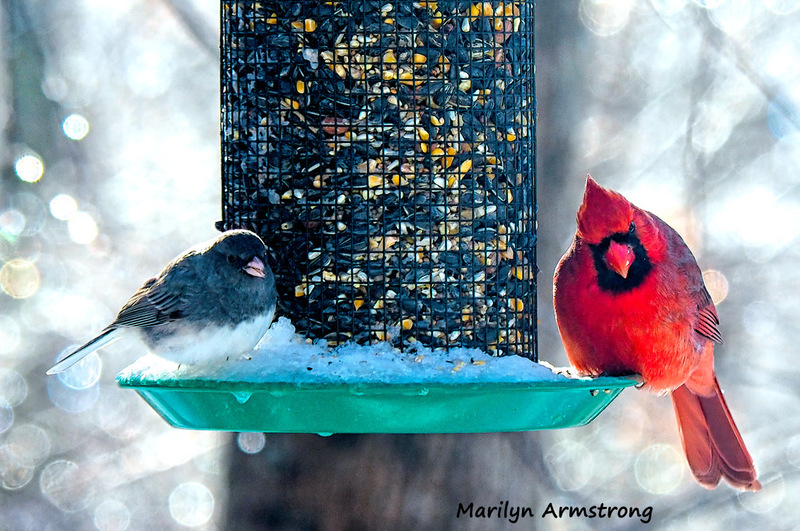 Cardinal and Junco – Frozen seeds? 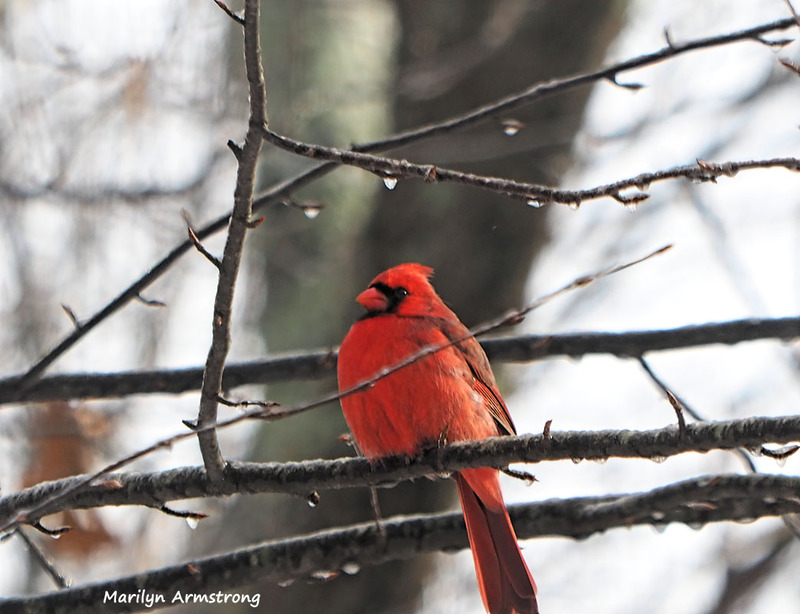 And Cardinal on a branch, too! 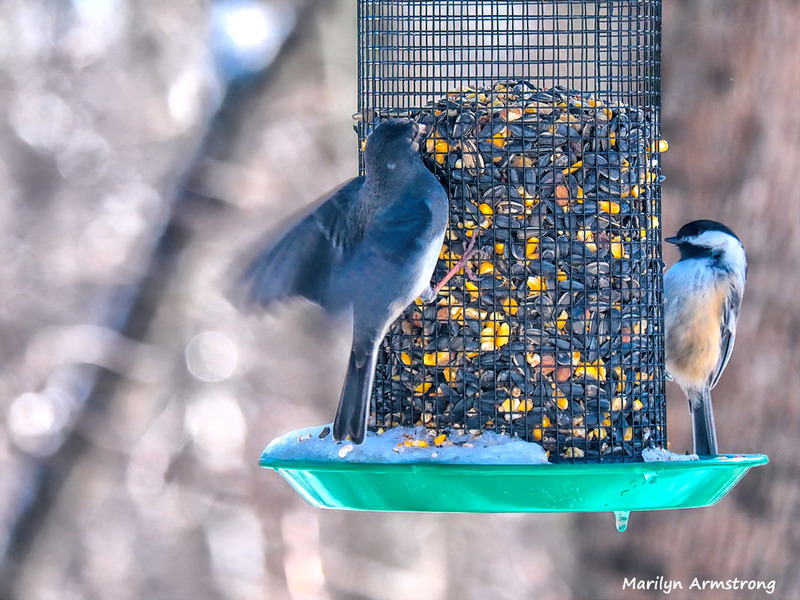 Nuthatch, Junco, Warblers – Pass that seed! 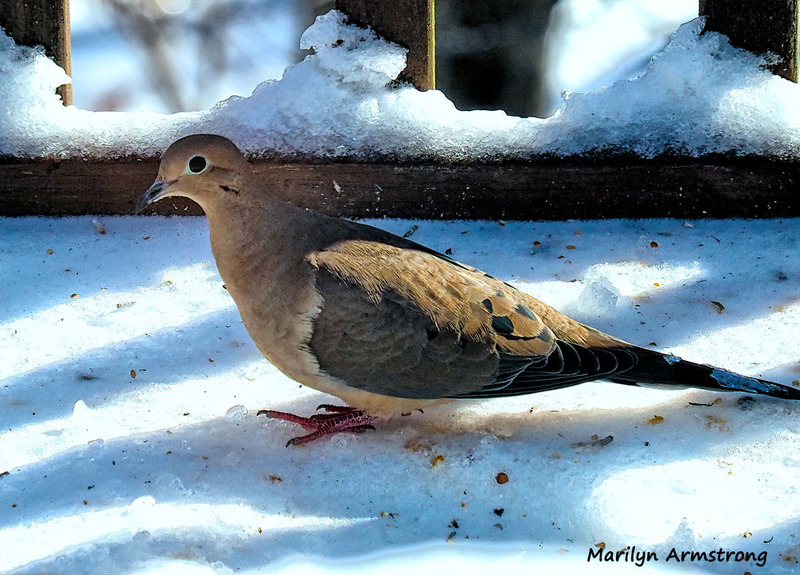 And a big mourning dove to clean up anything that fell on the deck! Aren’t they the most colorful bunch of cuties! 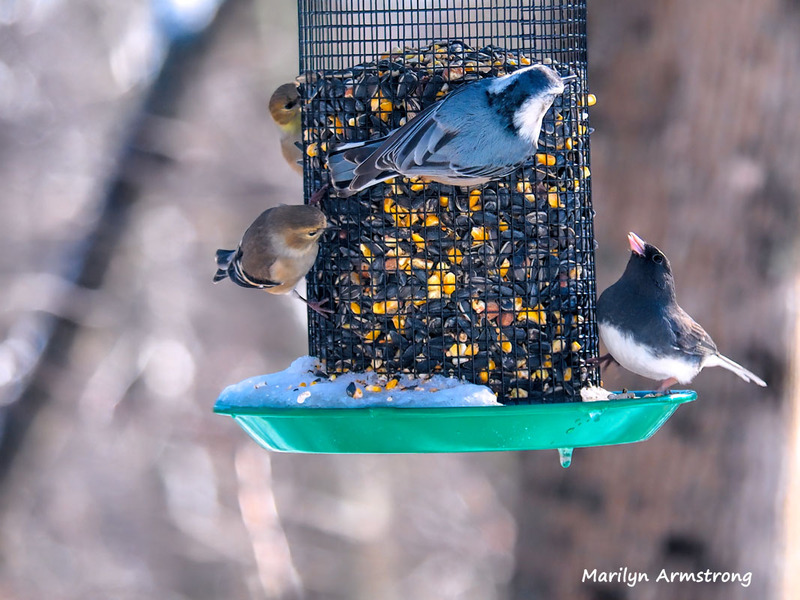 I think word has spread through our valley that Marilyn is putting out vittles for our feathered friends. Put it out….and they will come. A fantastic opportunity for bird studying and photography. And if ONLY I could properly tell the difference between a goldfinch and a warbler, life would be so sweet! 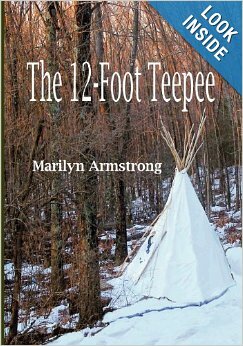 I think the word is out Marilyn. Good food here…. And plenty of it, too! They are beautiful. I stand at my kitchen window and just watch them for hours. I am not taking pictures today because I have so many pictures already. That really was a flock of warblers!! They are so cute. 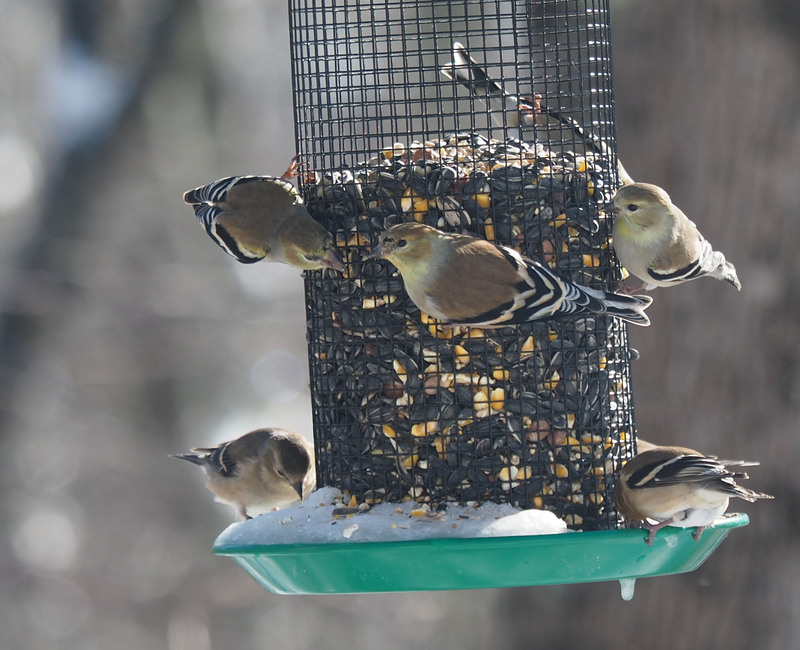 Someone told me they are Goldfinch. To be fair, they look very similar and are the same size, but my book assures me they are Warblers — who no longer migrate like they used to. And they don’t all look the same, either. What do you think? 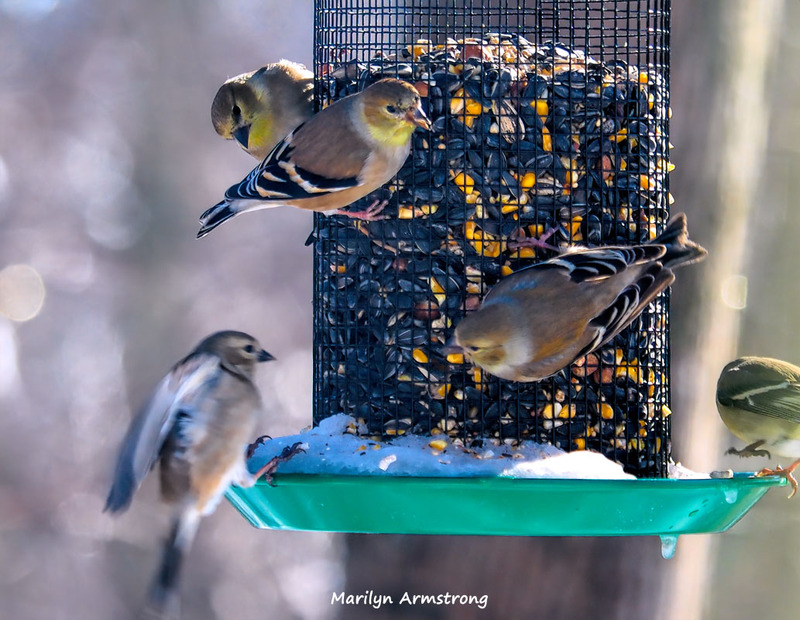 Marilyn, The birds you have been describing as warblers are American Goldfinches. 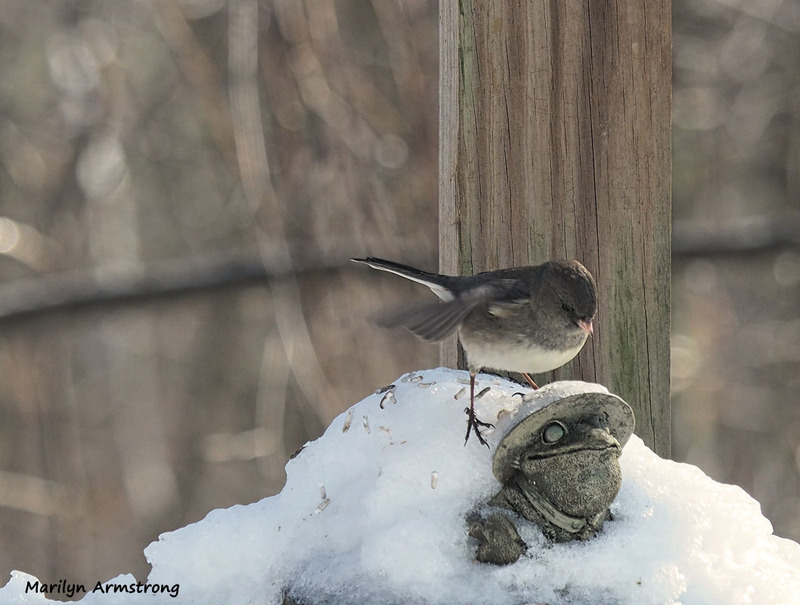 Check the Cornell Lab of Ornithology site for info and pctures. The warblers are gone until the spring. BTW great photographs. That is what I said, but according to my Peterson guide to eastern and central birds, the warblers have moved in and stayed moved in. Whatever they are, I sure do have an awful lot of them and they come in flocks. Moreover, some have barred wings and some don’t and they are a variety of colors from beige to yellow to pale green — and sometimes a mix of them which, I assume, are the little ladybirds. Worse, the American Goldfinch and the Yellow Warbler are the same size and look so much alike. And the warblers don’t migrate anymore. Whatever they are, there are a LOT OF THEM. Really. A LOT. With all different colors and wings with and without bars. I just looked it up again, just to make sure. Most of the warblers now live here all year round. Not all of them, but most. It is very hard to tell warblers from finches (a point mentioned in the book too, by the way). I think it is possible that I have both. Since both move around in flocks and they are the same size and color — and I can’t hear them from in the house (my hearing isn’t that good) — I really don’t know. I’m prepared to take anyone’s word for it because I’m apparently not a good bird identifier. What I have noticed is that birds don’t always look just like the picture in the book. A yellow patch can be closer to orange and a red patch can be big or tiny. Bars on wings can be distinct or not so clear and a white stripe may not be where the picture shows it. Like people, birds are individuals. The books and sites don’t mention this, but reality clearly shows it. I used the Cornell University website, but I’m sure the pictures are pretty much the same. In the winter, none of them is very yellow. I will know more in the spring when they show their breeding colors. I spent hours last night and I am pretty sure they are Pine Warblers — but not 100% because the two birds are SO closely similar. I found a gold-fronted woodpecker and the ones in New England have a red OR orange patch on their head and frankly, there is virtually no difference between them and a Hairy — except for that yellow patch above the beak that the Hairy doesn’t have. I think — with an edge of doubt because the birds involved ARE so much alike — that I’m right. 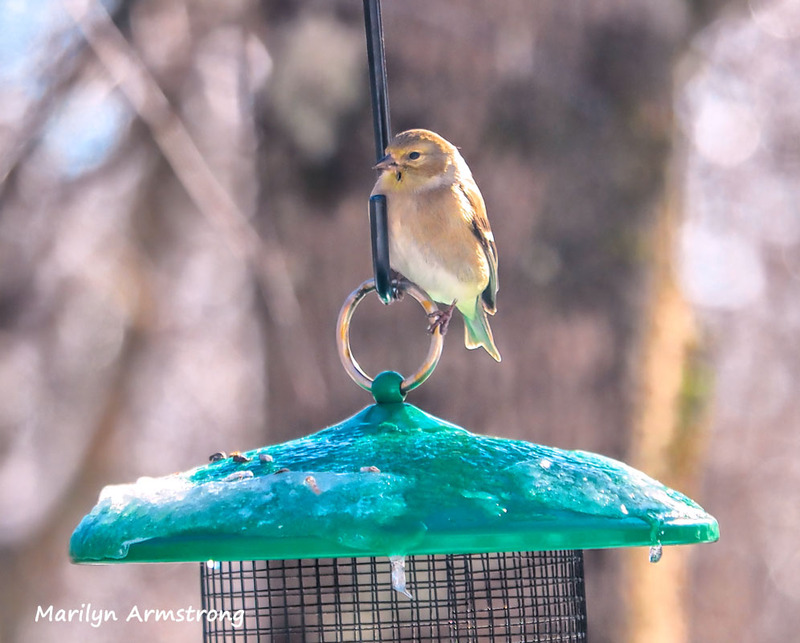 And the Goldfinch is the one who migrates. The Warbler hangs around. Better yet, they all eat the same food. In the winter, they will essentially eat anything. Woodpeckers traditionally don’t hang around feeders, but clearly, these haven’t read either the Internet OR the book because they’ve been hanging around with energy and enthusiasm, sometimes for hours at a time. Maybe it’s because we live IN the woods? I sometimes think that birds don’t do what they are supposed to do, either. As I said — these guys have been around a lot. I’ve had a couple just cling to the feeder for enough time to realize I should stop shooting because I’m running out of battery!